Late of Clarence Village on Queen, Grafton. Dearly loved son of June and Hugh (both dec’d).Dear brother and brother-in-law of Karen and Allan Pereira, Brian Anthony Ginger (dec’d), Garry Stoddart (dec’d), and Lynne Stoddart. Uncle of Bronwyn, Phillip, Douglas, Richard, Tammy, and Damian. 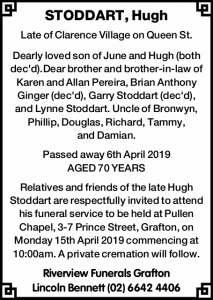 Relatives and friends of the late Hugh Stoddart are respectfully invited to attend his funeral service to be held at Pullen Chapel, 3-7 Prince Street, Grafton, on Monday 15th April 2019 commencing at 10:00am. A private cremation will follow.